Victory for the home side would see them pull to within a point of their visitors, who have hit a dip in form of late - winning just one of their last four matches, a run that included a shock 4-1 hammering at Herne Bay. 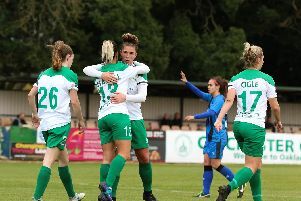 They were held to a 1-1 draw with Guernsey on Saturday, although had to play a big spell of the second half with nine men. Di Paola said: "Our league is such a weird league, you can have a run of six or eight games and say you are in form. The Bostik Premier has been similar this year, but our league is normally very strange as a team will often go on a run out or nowhere, like Herne Bay recently. "From Hastings' result Saturday, they had nine men for a lot of it as well so that changes that. The Herne Bay one could just be one of a freak one like we have had at times, they happen. "I think they are a really good team. I have said it all season that they are probably the best team in the league behind Cray. "I feel like it sounds as I am batting it off a bit, but we aren't that worried and there isn't a lot of pressure. I am not saying 'this is a game we have to go and win'. There are 14 games left, we have a bit of a cushion between the chasing pack and we are already exceeding expectations really. "We have a tough couple of months, but we'll approach them the way we had done and give them our best." Team news sees Lewis Hyde starting the first game of his three-man ban and midfielder Charlie Harris ruled out through injury. Kick-off at Culver Road is 7.30pm.